Your local Cairns Electrician for all Electrical, Solar and Air Conditioning needs! Southern Cross Electrics & Air Conditioning is a locally owned and operated family electrical business. With over 15 years’ experience, we have the know how to get the job done and get it done right. We pride ourselves on going above and beyond with our customer service and make sure every job is completed to the highest standard. A satisfied customer who keeps coming back is what we are all about. Southern Cross Electrics & Air Conditioning is owned and operated by a Cairns local, Matt McArthur. After completing his electrician apprenticeship in 2008, Matt gained experience with local and national companies over the following years. With his work and travels Matt has worked on a diverse range of technologies and settings. These include home electrical work, shop fitting, security and CCTV, Air conditioning, mining and refinery process work. Matt and the team at Southern Cross Electrics & Air Conditioning have a strong work ethic, healthy curiosity to keep up with new technologies, and attention to detail. We have demonstrated excellent service to our clients over the years. 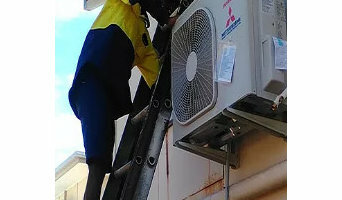 Of course, Southern Cross Electrics & Air Conditioning is fully insured, Contractor Licenced, with national accreditation from the Australian Refrigeration Council and Clean Energy Council. Electricians in Cairns, Queensland plan, install and repair your home's electrical wiring, circuit boards and electronics. They read blueprints, measure and test electricity and have a thorough understanding of Cairns, Queensland building codes. While most electricians are known for their work installing power points, or altering switchboards and safety switches, his or her job also includes installing and repairing a variety of fixtures such as ceiling fans, security systems, fire alarms, air conditioners and other visible components of electrical systems. On a construction site, an electrician in Cairns, Queensland may work closely with project managers and builders to determine the specific electrical needs for your project. Here are some related professionals and vendors to complement the work of electricians: Lighting, Building Project Managers, Solar Power Contractors, Heating & Air Conditioning Contractors. Find an electrical contractor on Houzz. Narrow your search in the Professionals section of the website to Cairns, Queensland electricians. If you’re planning a large-scale project, you’ll find other professionals on Houzz who can help get the job done, too.